Wiejce is a paradise for lovers of peace, hiking, cycling, horse riding, as well as mushroom picking! The surrounding paths in the Notecka Forest are also an ideal place to organize a carriage ride. 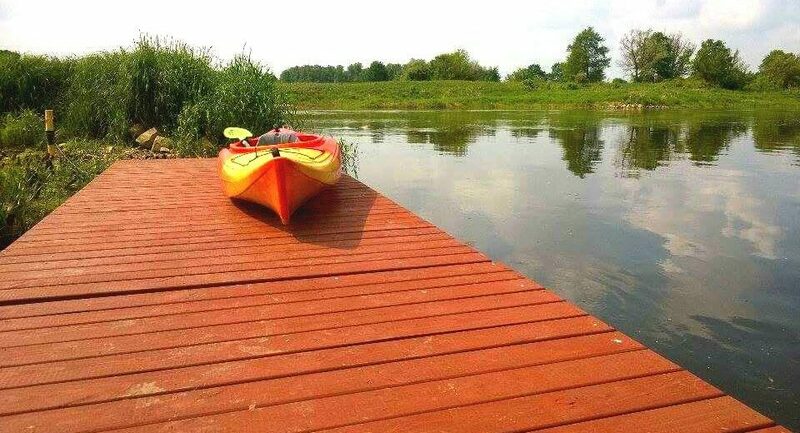 In addition Warta River which flows through the estate creates great opportunities for canoeists, and the river's banks and numerous lakes will provide anglers with unforgettable experiences. Water sportsmen and sportswomen will have plenty to keep themselves busy around Warta River. The estate has its own marina on the Warta River which is 100 meters from the palace and is located between the 115th and 116th kilometer of the river. For those visiting us by water, we recommend that you visit our Kukuryku Restaurant and stay at the estate for the night. At the marina we also offer access to electricity and the possibility for using sanitary facilities. We will be happy to assist in the organization of canoeing trips, water trips and cruises. At the heart of the estate, there are stables and a carriage house. For our guests we have prepared a wide offer, which we adjust to individual riding skills. We organize group as well as individual horse riding lessons conducted by our instructors. For more advanced riders we have prepared rides on our thoroughbreds: Dakhan and Garcia. * Individual driving instruction costs PLN 60. The lesson lasts 60 minutes. Lessons available upon an advance phone or email reservation. The property located on the Warta River, which flows just 120 meters from the Palace, is a great starting point or marina water madness. The organization of the Warta runoff is facilitated by the newly built marina in Międzychód, Sieraków, Wronki and Oborniki and the quay in Skwierzyna. These points are a great facilitation when mooring, organizing events or organizing rest during rafting. In addition, the starting point may also be Przystań Wiejce, which is located between the 115 and 116 kilometer of the Warta. Marked routes – black, yellow and green trail – cross the forest along its length and breadth. At your disposition are marked forest paths and calm tarmac roads. The Warta river palace is an attractive destination for anglers. Picturesque location, richness of nature and diverse fish stocks make our stretch of the river eagerly visited by fishing enthusiasts. The area around the estate is dominated by fish species characteristic of the upper course of the river – ide and chub. You can also find roach, bream, carp, claw, bleak, perch, pike, zander and catfish. In the village of Mierzyn, five minutes away from the estate, there are ponds stocked with zander, trout, pike and carp. The estate is located at the heart of an area known as The Land of One Hundred Lakes and encompasses the lakes of the Noteć Forest. The lakes are known for richness in many species of fish. Every autumn the Notecka Forest is visited by hundreds of mushroom pickers. But do not worry there will be enough mushrooms for everyone to pick! The forest is famous for being rich in the following edible mushroom species: birch bolete, slippery jack, boletus, bay bolete, chevalier mushroom, chanterelle and parasol mushroom. The estate staff will be happy to assist you in finding the spots most fertile in mushrooms. A few times the the estate hosted the famous annual nationwide Bay Bolete Festival. Just five minutes drive from the palace we offer you the unique experience to try target shooting at our shooting range. It is equipped with five clay pigeon catapults for shotgun users and rifle shooters can enjoy a moving boar target at 50 meters and a stationary deer target at 100 meters. Trying your skills at the shooting range does not require any previous experience with weapons, so that everyone can have a go.